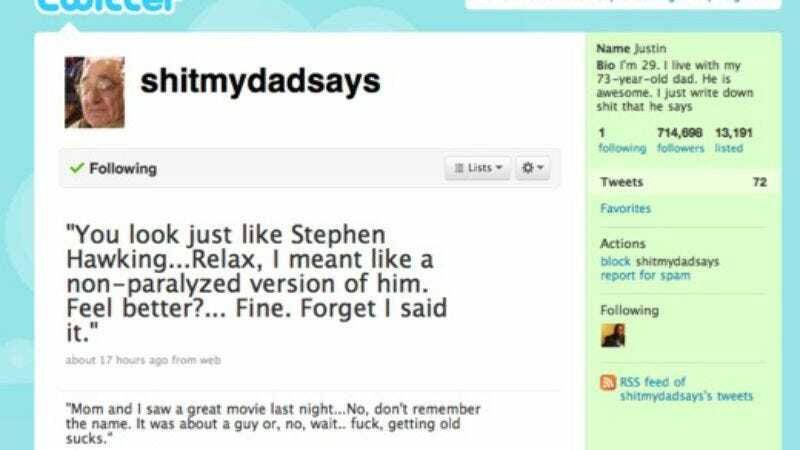 A month ago, 29-year-old Maxim.com editor Justin Halpern landed a book deal for his popular Twitter feed shitmydadsays, on which he dumps the irascible, profane mutterings of his 73-year-old father. Now CBS has signed a deal with Halpern to develop a sitcom based on the feed, with the help of Will & Grace creators David Kohan and Max Mutchnick. The project is still in the script-development phase, which means casting, shooting a pilot, ordering a series and changing the name are still a long way off. Still… a show based on a Twitter feed. That's where we are.